The Renegades Trilogy continues, in this fiercely awaited second installment after the New York Times-bestselling Renegades by Marissa Meyer, author of the Lunar Chronicles. But they each other’s worst nightmare. As Insomnia, she is a full-fledged member of the Renegades, a syndicate of powerful and beloved superheroes. She works with Adrian’s patrol unit to protect the weak and maintain order in Gatlon City. As Nightmare, she is an Anarchist - a group of of villains who are determined to destroy the Renegades. Nova wants vengeance against the so-called heroes who once failed her when she needed them most. But as Nova, her feelings for Adrian are deepening, despite the fact that he is the son of her sworn enemies and, unbeknownst to Nova, he has some dangerous secrets of his own. 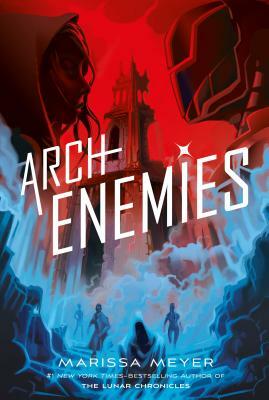 In this second installment of the Renegades trilogy, Nova, Adrian, and the rest of their crew – Ruby, Oscar, and Danna -- are faced with escalating crime in Gatlon City, while covert weapons and conflicting missions have Nova and Adrian questioning not only their beliefs about justice, but also the feelings they have for each other. The line between good and evil has been blurred, but what's clear to them both is that too much power could mean the end of their city – and the world – as they know it.